Which parks are home to the best Coastal Redwoods near San Francisco? 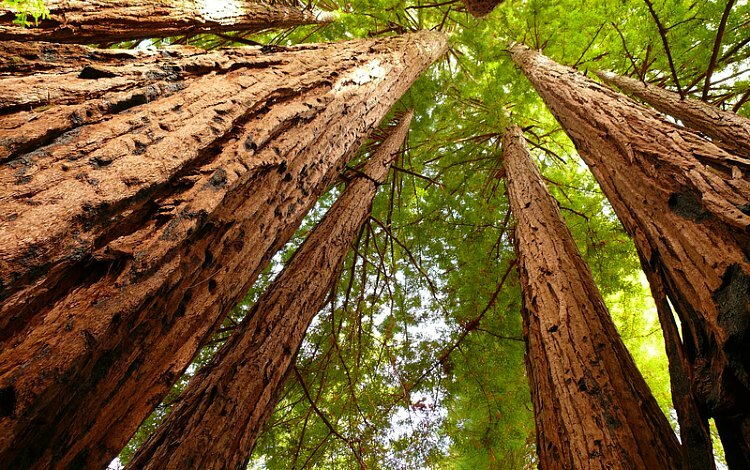 You will find more than 30 parks in California with Coastal Redwoods trees. Some are close by and others are hours away. To help you decide, I've created a list of the 6 best parks to visit that are all within 2 hours of SF. This will give you time to see them without having to spend an entire day (or more) on the road. I've included their distance from SF as well as a few tips for visiting. At the bottom of the page, I've also include a few more parks that are a little further away, but are quite famous. This way you can decide if you want to spend just the day or a couple of days admiring these gigantic beauties. 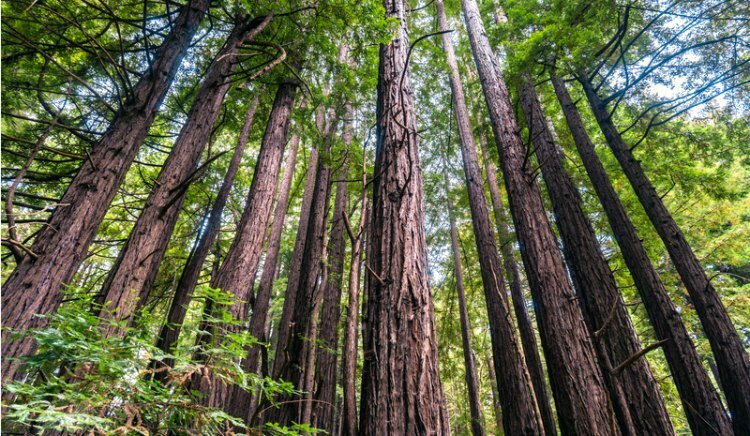 Coastal Redwoods vs. Sequoias: What's the Difference? What is the difference between redwoods and sequoias? Even though many people confuse them, they are closely related and yet not the same. Coastal Redwoods are only found near the coast in California between the northern border of the state and then south to the Big Sur area. They are the tallest trees in the world and live to be several hundred years old. Sequoias are the biggest trees in the world, which means they have a large diameter. Sequoias also do best at altitudes of around 4,000 to 8,000 feet. You will find them in California in the Sierra Mountains in places such as Yosemite, Sequoia National Park and Kings Canyon. One other difference between the two is that the pine cones of the Sequoias are nearly three times the size of the pine cones from Coastal Redwoods. Many people mix and match these two types of trees as they both have a red coloring. However, Coastal Redwoods are taller and thinner and Sequoias are wider and shorter. 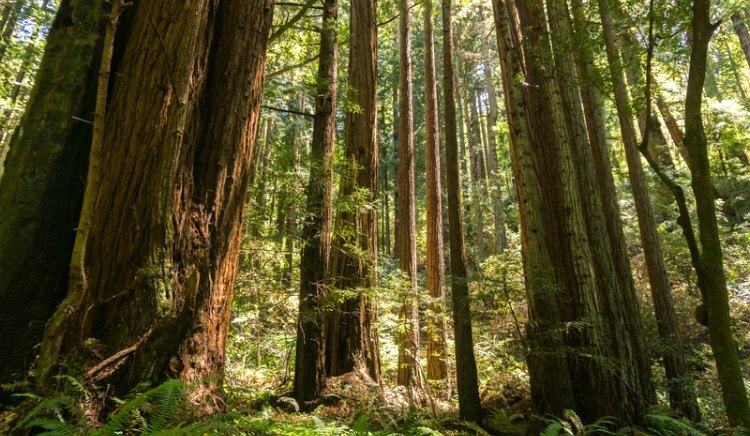 Muir Woods National Monument is the most popular option for redwoods near San Francisco. This park opened in 1908 and is the closest option near SF. You can stroll beside trees that age from 400 to 800 years old and enjoy a few exhibits to learn more about them. The main trail is mostly flat and there is a visitor's center, which is why this one is most visitors first choice. It's open 365 days a year. You will need to make a parking or shuttle reservation as they are attempting to relieve overcrowding. Learn more about visiting, how to book a tour, and where to reserve a parking/shuttle spot if you plan to go on your own. Samuel P. Taylor State Park is not an option you will find on most lists for redwoods near San Francisco. However, I love this park for a few reasons. It's more of a locals "go to" for some easy to moderate hiking. The reason I love this one is that you can camp among the redwoods. If you are traveling with kids and want something a little different, then check out this option. If you just have a few hours to half a day and want to check out some of our famous tall trees, then head to the Pioneer Tree Trail. 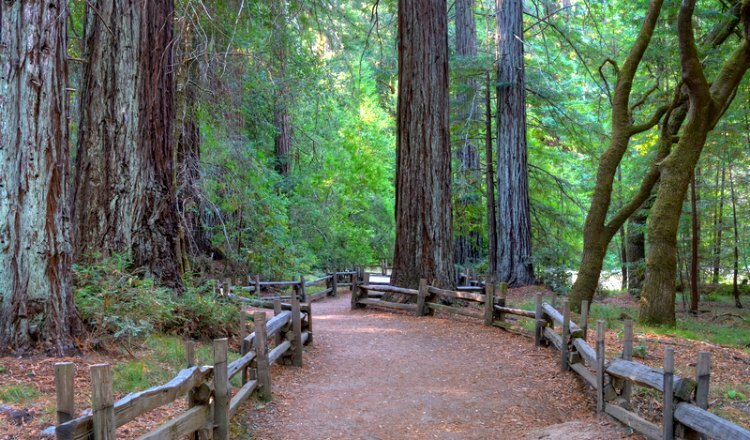 It's a 2.7-mile hike and it will take you to an old-growth grove of redwoods in this park. Armstrong Redwood State Natural Reserve is north of San Francisco in Sonoma County. Here you will find 805 acres of Coastal Redwood trees. This reserve has a small visitor's center, places to have a picnic among the trees and several self-guided hiking trails. There are also several roads for you to drive among the trees. It's free to visit, but they do ask for donations at the visitor's center. Big Basin Redwoods State Park is another great option for those wanting to see redwoods near San Francisco. It originally opened in 1902 and is California's oldest state park. Some of the giants in this park are more than 50 feet in circumference. The oldest trees here are anywhere from 1,000 to 1,800 years old. This park has more than 80 miles of hiking and some gorgeous waterfalls. If you just want to do a short hike and check out the trees, then take the Redwood Loop Trail. It's a 0.6 mile loop that is mostly flat and you will stroll by some of the best redwoods in the park. If you have a bit more time and want to do a little more hiking, then check out the Sequoia and Skyline to the Sea trails. This is a 4-mile loop that will show you even more of these beauties. There is a small store in the park where you can pick up goodies for your hike and it's right across the street from Park Headquarters. Henry Cowell Redwoods State Park is another place to admire the gorgeous redwoods near San Francisco. 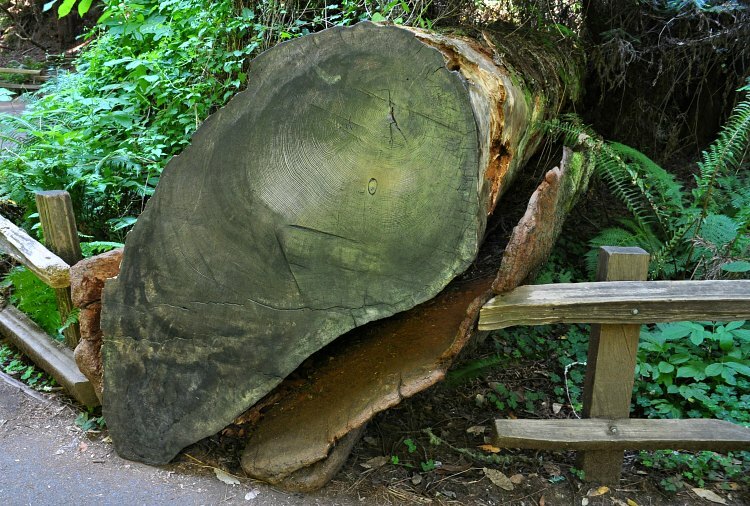 This park is famous for its old-growth redwood trees. This grove is 40-acres and the entire park is more than 4,600-acres. The tallest tree in Henry Cowell Redwoods State Park is 277 feet tall and about 1,500 years old. While you are here, make sure to step inside the famous Fremont Tree (it can fit an entire family!) and take a photo. One of the unique features of this park is you can see a Coastal Redwood, Giant Sequoia, and a Dawn Redwood planned side by side near the entrance. The second two are not native to the park, but it will give you a great idea on the different among these three living giants. In addition to the trees, you can also do a little hiking, swimming or cycling here. The visitors center is also open most of the year. Just to the north of Big Basin Redwoods State Park is the Portola Redwoods State Park. 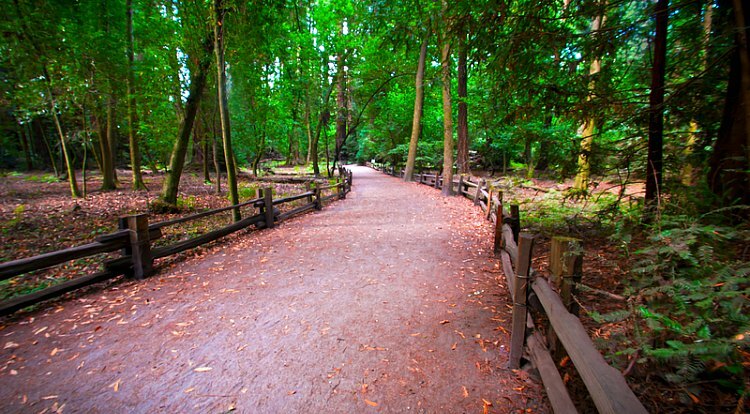 This park is about 2,800-acres and offers a great look at some of the best redwoods near San Francisco. You will find more than 18 miles of trails inside the park. The most walked path is the Old Tree Trail. This trail offers a 1.2-miles round trip through these ancient giants. At the end of this trail, you will find a single tree called the Old Tree. It's one of the tallest in this area--standing at around 300 feet tall. It's about 1,200 years old and is an amazing sight to see. You will also find some other great redwoods along the coast throughout Northern California. These are a few additional places that are highly rated. My favorite of all of the parks with redwoods near San Francisco is Humboldt Redwoods State Park. It's home to the largest forest of old growth Coastal Redwoods which is called Rockefeller Forest. This old growth forest covers about 17,000 acres or about one-third of this state park (out of a total 53,000 acres). Another area here that has made the park famous is the Avenue of the Giants. It's a 32-mile stretch of trees and is best place to see these giant redwoods by car. There are also a few places to stop along the way to see them up close. You will also find some great places to camp and hike here too. Another wonderful place to see redwoods near San Francisco is at Redwood National & State Park. This is a group of four parks right near each other that are managed together by the National Parks Service and the California State Parks Service. They include the Redwoods National Park, Del Norte Coast, Jedediah Smith, and Prairie Creek Redwoods State Parks. Highlights here include both the old growth forest and the Roosevelt elk in the prairies between the redwoods in Prairie Creek Redwoods State Park. Jedediah Smith Redwoods State Park is home to the largest (not tallest) Coastal Redwood tree. Del Norte Coast has a large population of old growth redwoods as well as a stunning coastline. You can drive through several sections of the trees, go hiking, spend the night camping or learn more about the parks in the visitors center. You could spend a full day or even a weekend exploring this area. Looking for a place to stay in Humboldt County? Click here to find some great hotels deals on TripAdvisor. Something that I love about Hendy Woods State Park is that it is a little warmer than all of the other redwood parks as it's further inland. It's also home to two old growth sections of trees. One is called Big Hendy, which covers 80 acres. The second is called Little Hendy, which covers about 20 acres. It includes around 5-miles of trails. Some of the trees here are estimated to be more than 1,000 years old. Several are more than 300 feet tall. It's the only redwood forest in the gorgeous Anderson Valley and is the perfect stop for those wine tasting in this up-and-coming wine country region. You won't find any of the drive through redwoods trees within the 2 hour driving time from San Francisco. Most of them are much further north. Here are a few to look out for on your visit to the area. All of these are along US Route 101 and are privately owned. You will need to pay to drive thru each one. The Chandelier Tree is located in Leggett in Mendocino County which is just over three hours north of San Francisco.. The tree is part of a privately owned redwood forest. Most cars are able to fit through the tree except motor homes or cars pulling trailers. You can visit the park and/or just pay the entry to drive thru the tree. You will find the park at 67402 Drive Thru Tree Rd, Leggett, CA 95585. The oldest of the three drive-three redwood trees is the Shine Drive-Thru Tree and It's just to the south of Humboldt Redwood State Park, which is about 4 hours north of San Francisco. It was hollowed out by a lightning storm and then left as is by loggers that didn't think it was valuable enough to cut down. As it's aged, the tree has leaned to the side a bit and is now supported by some metal cables. However, you can still drive through it. The opening to this tree is about 7 feet by 7 feet, which will allow a variety of cars to get through. There is a small cost to drive thru this tree. You will find it at Shrine Drive Thru Tree, 13708 Avenue of the Giants, Myers Flat, CA 95554. The Klamath Tree, also referred to as Tour Thru Tree, is located 6 hours north of San Francisco. 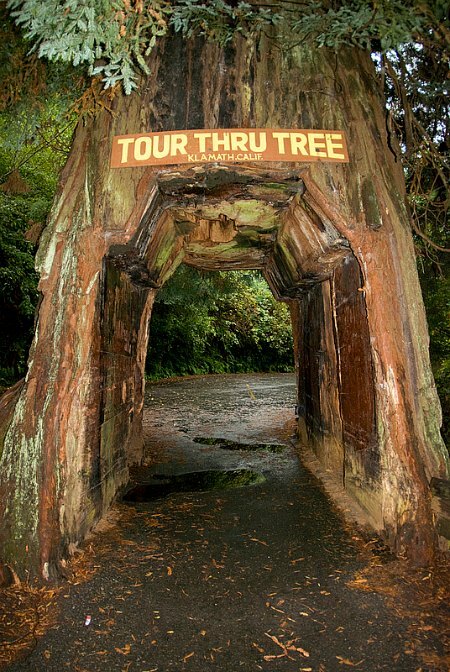 It's the second most popular drive-thru tree tour. It's open all year long and nearby you will find a gift shop, restrooms and a place for a picnic. Although it isn't the most popular drive thru tree, it's the largest and can accommodate larger vehicles. It's over 7 feet wide and is about 9 and a half feet tall. You will find this one at 430 CA-169, Klamath, CA 95548. Do you need to rent a car for your journey? Check out my car rental page for details and great deals.